Just Jingle: Catch A Wave! - Newton's Nook Blog Hop Time! Hello, friends! I am super excited to be participating in the celebration of Newton's Nook Designs' first year! I was honored to be a part of the very first Newton's Nook Designs Design Team and I have truly loved watching the company grow! They have such cute designs and I just love their stamps! We have a FABULOUS blog hop for you today featuring some really great designers AND PRIZES!!! You can start right off with the Newton's Nook Blog! I am excited to be playing with some of the BRAND NEW July release stamps for the hop today! I am loving these fun surfboards! As you can see, I decided to stamp the board several times, colored them, and then cut out one of the surfboards to create a shaker! I stamped the image onto the acetate before adding it to the shaker box so the board details would still be there. So much fun!!! I used some great Carta Bella papers from the Ahoy, There! Collection. I love how these papers worked so well with the stamps! Totally fun! Your next stop on the hop is Emily Leiphart! Be sure to head on over to check out the inspiration and the great chance to win some prizes, too! Celebrate with us and enter to win!Would you like to win a $10 coupon for Newton's Nook Designs online shop? We will be choosing TWO lucky winners! Here’s how to win:Comment on the Design Team Member and Guest blogs (see list below)! TWO winners will be chosen at random from the collective blogs in the blog hop. Make sure to check out each of their blogs and comment for your chance to win. You will not know which blog has been chosen so the more you comment on the better your chances are of winning! You have until Sunday, July 20th at 9 pm CDT to comment -- winners will be announced on the blog post on Monday, July 21st. We are running a giveaway on our Facebook page too so make sure to enter here for another chance to win!! Here is the full list in case you need it! Fun card! Love the nautical colors! Oh how FUN!! Love the surfboard shaker, so creative! Such a fun design! Great dp! What a fun spin on a shaker card! Love the sparkle! Would never have thought to make a surfboard a shaker, but it's fabulous! What a fun twist on the shaker trend! Very cute! Love the shaker surf board, very different and clever! A shaker surfboard...who'd a thunk. This card is so fun and happy. Lucky recipient. Super cute! Love the shaker! What a fun card! I love that you turned it into a shaker! Super cute and fun card! I would've never thought to make a shaker card with the surf board, so clever! Gotta love the shakers and yours is so clever! Your card is adorable with the shaker surf board!! What a great idea!! Love all the surfboards!! I love that one of the boards is a shaker card. 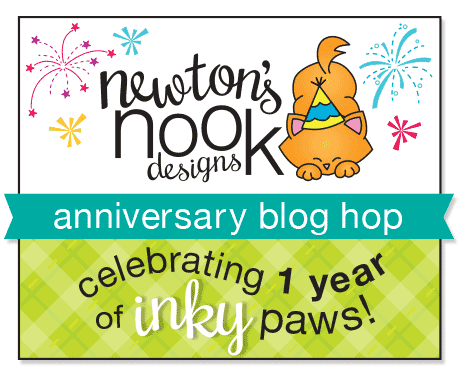 Happy one-year anniversary to Newton's Nook Designs! Fun shaker card - love the sequins! What a creative way to do a shaker! I have not yet done one, but I love the way you think outside the box! LOVE your SWEET surfboard shaker. Thanks for sharing. What a cute idea—I never would have thought of making a surfboard shaker card! Love it! Oh, WOW! How fun and cool is this?! !...Love it! Love the surfboard shaker--so cute! Like the surf boards and the shaker. Very creative. Awesome shaker card. Makes me want to hit the water . Love the fun design and shaker surf board. Very clever idea to make a surfboard shaker! Nice card. Innovative placement of a shaker. Wow what a card who would of thought of making a surf board shaker card...you! Love it!! Love your surfboard shaker card! Great idea! This is such an ingenious shaker card - great job! Thanks so much for being part of our fun blog hop! This card is so fun -love the surfboard shaker! 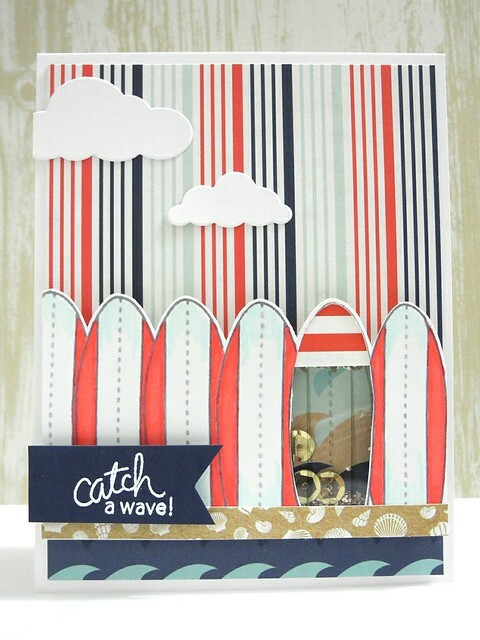 What a great blog hop - love the surfboards and the shaker card. Hopping along . . . So cool love this idea. thank you for sharing! It's like that paper was made for this set. Very cute card, the shaker is so well done. Lovely idea! Super cool card! I love the patterned papers you chose! Thank you for sharing. Thant is delightful Jingle! How creative to use one of the surf boards as the area for shaker card! Maximum interest and fun!!! Such a creative way of using the surfboards! What a great card! I just love that you turned one of the surfboards into a shaker element. So very clever! What a fun and fabulous idea for a shaker card!! What a unique card- Love the beachy scene! You are so clever! What a terrific surf board shaker card!!! Love the colors and design-beautiful shaker card! oh my goodness!!! what an incredible card!! i LOOOOOOOOVE the shaker you added with one of the surf boards!! such an awesome idea!! and that chunky glitter inside the shaker seriously ROCKS!! so so so so cool!!!! The shaker element looks great! What a cute card. I love the shaker surfboard! Love your take, Jingle! Want to shake that shaker! LOVE shaker cards! Fun summer design. 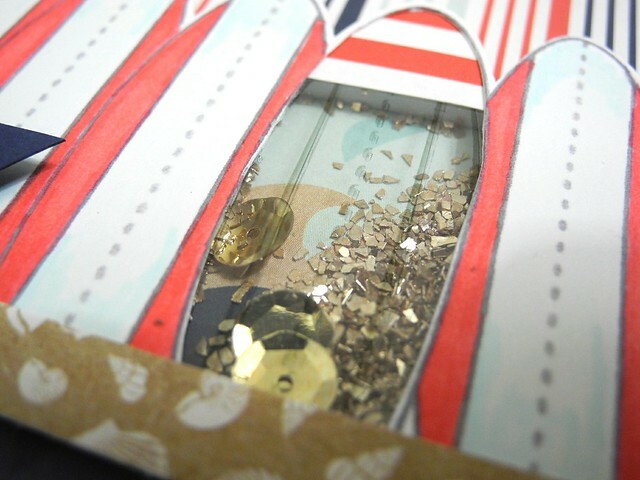 Fun nautical card...love how you made the shaker element. What a fun beach card, complete with shaker! Thanks for the inspiration! Cute! Fun and unique card! Cool idea to stamp surf board on acetate to maintain consistency in design. Loved that tech and will be trying it out. Thanks for sharing. I love the little peek of the shaker behind the surf boards!!! Too cute!! Love the shaker surfboard element, very cool! So creative! Love the shaker surf board!! Super fun shaker and great beachy feel! TFS! Such a super neat idea! Love it! awesome shaker card! Very fun! Such a clever card! Love the fun design, the graphic papers and the surfboard shaker!! I love shaker cards and this on is so clever! Thanks for sharing. Such a creative card - love your idea! Hee her…funny that you say you are a big fan of comments. I am becoming a big fan of yours! I love the kitty!! :-) So cute! I think the surfboard card if very clever. Love the shaker box!! So cute and innovative!